Photo courtesy of Go! St. Louis. Athletes, families and spectators heading to the GO! 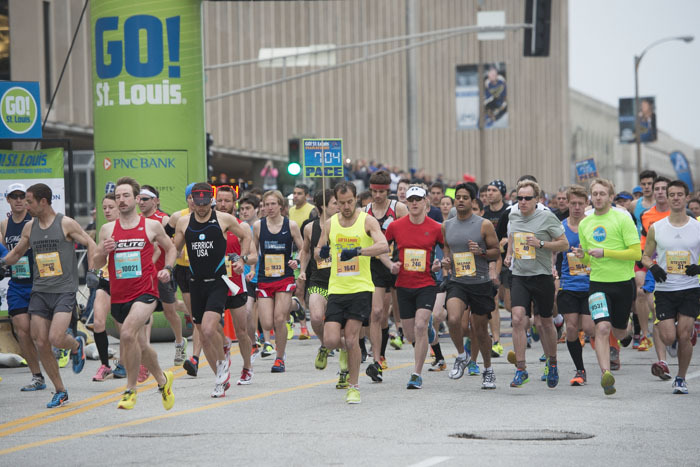 St. Louis Marathon events downtown on Sunday (April 10) are encouraged to ride Metro to get to all of the excitement. Race participants and fans can park at any of the 21 free Metro Park-Ride lots in Missouri or Illinois and ride MetroLink to the Union Station or Civic Center MetroLink Stations, which are both within a few blocks of the start and finish lines. MetroBus is another great option for getting to the events in downtown St. Louis. Race participants can ride on one of 13 MetroBus routes to the Civic Center Transit Center and walk a couple blocks north to the starting line. Plan your trip to the GO! St. Louis events on Sunday by downloading the Metro On The Go app to your mobile device, using the Trip Planner or by contacting Metro Transit Information at 314-231-2345 or 618-271-2345, Monday through Friday from 7:30 a.m. to 4:30 p.m. The 15th annual GO! St. Louis events will have a major impact on Missouri MetroBus routes on Sunday, April 10, in downtown St. Louis, Soulard, Forest Park, the Central West End and other areas around the city of St. Louis. Street closures to accommodate the GO! St. Louis events will begin very early in the morning and will be in place until about 5 p.m. Sunday. Due to these street closures, 19 MetroBus routes will be rerouted at various times on Sunday. MetroBus passengers should allow extra travel time for their commutes on Sunday to allow for the detours. MetroBus passengers are encouraged to check Rider Alerts for specific details of each reroute before planning their trips for Sunday, April 10.